On Friday, Facepunch Studios made the mistake of talking publicly about one of the prototypes they’ve been working on. No sooner had programmer Adam Woolridge introduced arcade shooter Rift-Light, than commenters concluded that Early Access funds were being used to divert manpower away from Rust. In a spurt of crowdsourced fiction, others decided that the Steam-swallowing survival game had been cancelled outright. 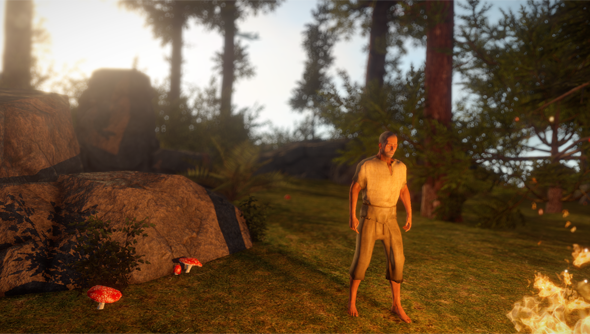 Not only have Facepunch got lots of work left to do on Rust, said Garry, but they haven’t finished work on Rift-Light either, nor the three other prototypes they have in development. And before tying up any of those projects, Garry wants to hire more programmers to begin yet more prototypes. Facepunch have bankrolled new projects using money from their two wildly successful ventures: Rust and Garry’s Mod. And that, Garry suggests, is not something they should have to justify. “Arguing that we should be re-investing that money back into only those games is like telling Apple they can’t spend the money they made from iPhone and Macs to fund the development of the iPad,” he wrote. Rust has not be abandoned. Far from it: development has stepped up since early Steam sales proved “insane”. The game’s being updated “very regularly”, and the suggestion it isn’t “hurts” when Facepunch are “working all week on it”. Okay. Is that all cleared up, then?